Select a material Cherry Walnut Mahogany Surprise Me! Hand-carved for the perfect shape, these beautiful wooden needles are perfect for any application! After they are carved the needles are sanded till they're super smooth, and buffed with a natural beeswax blend. The needles are 18" long and are on average 1/2" wide at the base and 1/4" thick. 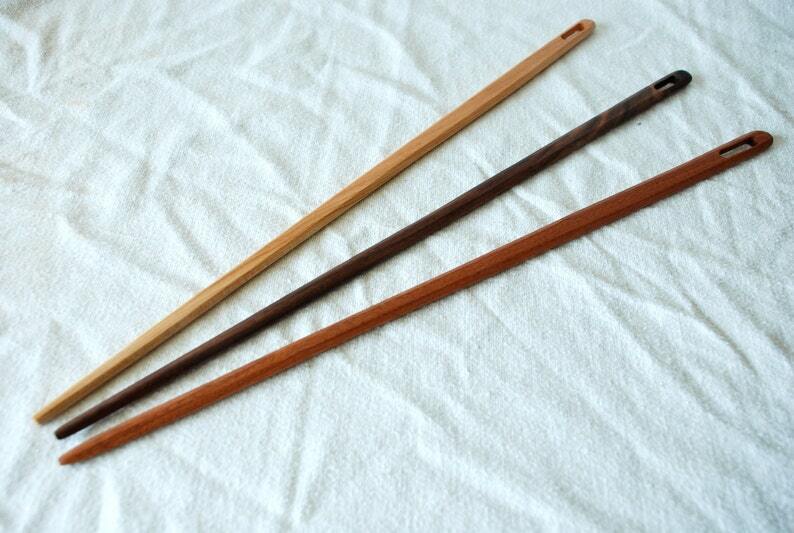 These wonderful needles are made of various types of exotic hardwoods you can choose from! Check the second picture in the listing for the examples of the different woods. 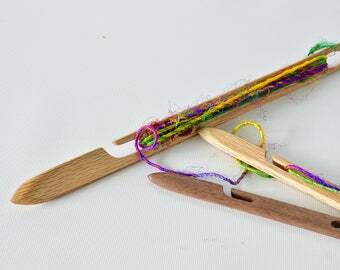 You can use our them for any number of weaving and crafting purposes including tapestry, small looms, hand weaving, nalbind, viking knitting, pick-ups and small detail work! We now offer a Surprise Me option on many of our smaller tools. This is great if you can’t decide which beautiful wood you like best. Plus, you might even get a wood not listed, as Maggie does like to experiment with different exotic woods from time to time. All woodworking products are hand-carved so there will be some variation in sizes and appearance. If you would like one of our products in a custom size, let us know and we will see what we can do! Be sure to check our other listings, as we have many tools in all styles, along with lots of other useful and unique fiber products and offerings! All our items are currently made to order. This means that there will be some delay before orders are sent out depending on the items ordered. Please check under shipping on the side bar for time frames for each item. We thank you for your patience and understanding. Be sure to check our FAQ for more shipping info and a Master list of all our looms with weaving length. If you'd like to learn more, read our blog and learn about sales and other fun stuff... please consider checking out our website! 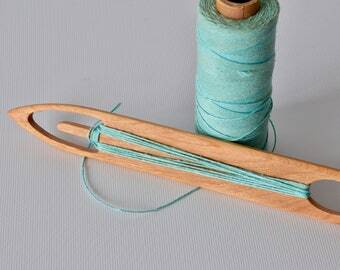 I ordered these because the needle that came with my loom was only 12 inches an had a very blunt nose on it. It's my first loom and weaving attempt, but after a short time of working my loom it was just apparent that I needed/wanted a smoother, more narrower tipped and much longer needle to weave through my wall hanging to be. I ordered 2 of these and they're just wonderful. Beautifully made, smooth, 18 inches (oh boy). I just love them. In fact I just reviewed my loom purchase on Amazon and advised anyone buying that loom to look you folks up to purchase your tapestry needles as it makes weaving so much more enjoyable. Thank you! A very useful and well-crafted tool! Thank you! Great and quality product. Great seller. Very useful, and nicely handmade. We accept credit cards and Paypal through Etsy. If you would rather purchase our wares with a check or money order, please drop us a convo and we can arrange a purchase for you. I'm sorry, but we do not normally accept custom orders, however, you can inquire and we would be happy to consider anything that you need. Just use the conversation function on your Etsy account and we will get right back with you. We gladly accept returns if you are unhappy with your products. Please let us know and we can arrange for their safe return and a refund of your purchase. We ship though USPS and do include insurance on our orders. Any damage or loss through the mailing process will have to be taken up with them, however, we strive to pack and wrap all our products securely and some even say, a little over the top! We want to make sure that everything arrives SAFE and sound! We ship as quickly as possible! All of our items are made to order, though we are trying to build up our stock. All our items ship USPS. We have a program that updates our orders and adds tracking numbers as soon as the package is ready to go out. So if you are unsure if your package has shipped, please check for a tracking number. All of our orders for the day go out around 3:30 pm EST, so we would appreciate it if you checked on your order after that time. Your purchases help a young lady to develop her skills and her company and her family thanks you for a chance to show you her wares. As an autistic young adult, this purchase means a very great deal to her and she thanks you as well! Thank you!!!!! Accordion - Makes 6.5 ft band /or can be set up with take up rods for longer warp - Comes with appropriate shuttle - can be used for Inkle, Card, Rigid Heddle and many other styles of weaving! We use USPS for all our shipping. Small items under a pound are shipped First Class while our larger items are either Priority Mail or Parcel Post. We do our best to ensure your tools arrive safely, even if they have a rough ride! If you live outside of the US and would like to purchase from our shop, please send us a message with the items you would like to purchase and a basic address (city, country and postal code). We will let you know the shipping cost and/or set up a special listing for you with international shipping available. We are sorry about the extra step, and thank you for understanding.